Pre-christian ancestors appreciated the magical qualities of these plants. Two plants which bore fruit in the deep midwinter. By garlanding their homes with berry-laden, shining, green-leaved sprigs, they drew closer to the power and the hope that these plants represented. Today, when we bring them into our homes at Christmas or send greetings’ cards adorned with their images, we keep alive traditions that we instinctively feel to be important, but only half understand. 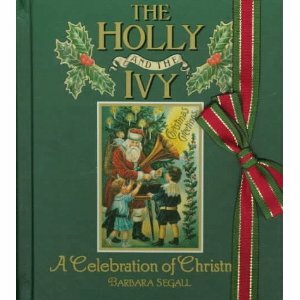 Holly and Ivy came in from the cold long, long before the first Christmas of all. They brightened the year’s end for Druids, ancient Greeks and Romans and, eventually, for the early Christians. In this book, we follow their journey and discover the magic that surrounds them. They appear in many guises at Christmas. They are our favorite Christmas decorations, welcoming us in the form of door wreaths, mantelpiece garlands, generous swags and traditional kissing boughs. As design motifs, they have enriched textiles, ceramics and decorative art throughout the world, making a delightful collection theme. The carols and poems we sing at Christmas are filled with their rich symbolism. After the Christmas festivities are over, we can enjoy them in gardens, balconies and (for ivy) the most modern of apartment interiors. The leaves of common holly (Ilex aquifolium) and ivy (Hedera helix) are so distinctive that they are said to be the only leaves that street-wise urban children can recognize. The paintings of Benjamin Perkins, which open each chapter of our story introduce some of my own favorites from the hundreds of plants that gardeners can treasure all through the year. As her first offering to her infant King.